What It’s About: Richard Burton takes a rare and improbable turn as an action hero in this tightly-plotted World War II thriller. As MI6 agent Smith, he leads a team of Allied special forces, including the American Lieutenant Schaffer (Clint Eastwood), in a stealth assault on a German castle. Their mission is to rescue an Allied general before the Gestapo can force him to reveal essential secrets…or is it? Novelist Alistair MacLean (The Guns of Navarone, Force 10 From Navarone) wrote the screenplay simultaneously with his novel by the same name. Why Watch it Today? : The film opened in American theaters on March 12, 1968. This was an era when intermissions were still de rigeur — I was sad to find that the DVD version has elided the intermission, which was a strange and memorable feature of the VHS version I watched many times as a teen — so the movie is long. Amazingly for an action movie, it’s worth all 158 minutes of it. Burton carries the unpredictable role of Major Smith with his incisive tones and unflappable gaze, but Eastwood is the real deal: an exciting pre-steroid era action star. His Lt. Schaffer is a man with drive, ambition, and dedication to his task. As a WWII Army Ranger, his task happens to be making sure that most of the German army becomes dead as efficiently as possible, using dynamite, machine guns, and wherever possible, his knife. Some of the scenes in the early part of the movie may not make a lot of sense on first viewing, as Smith, Shaffer and their team stow backpacks in woodsheds, jumpstart buses, and wire most of the Bavarian countryside with TNT. The quality of the acting, camera work and soundtrack, though, manage to keep an ongoing atmosphere of suspense. And there is a real payoff in the end, when for almost an entire hour you can watch the state of the art in 1968 movie explosions. They do not manage to blow up a boat, but jeeps, motorcycles with sidecars, tanks, airplanes, cable cars, woodsheds, air control towers, trees, bridges, and the better part of a castle all combust spectacularly. 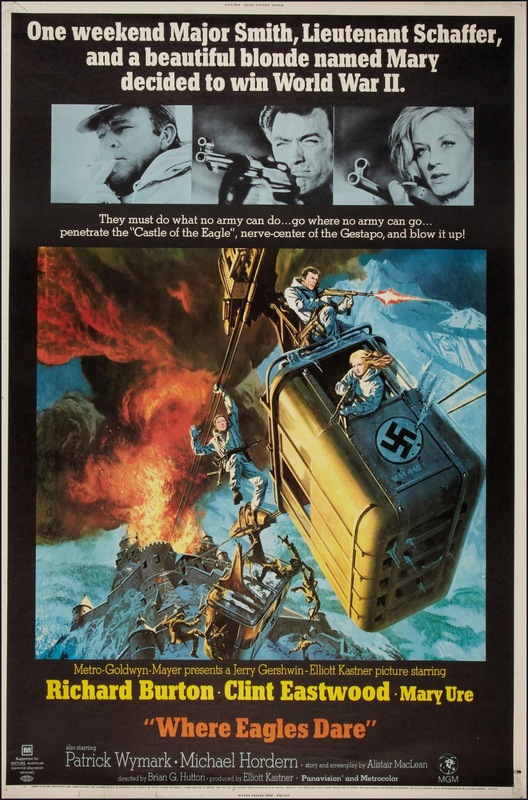 This entry was posted in Action, Espionage, Hostage Situation, Movie of the Day, Special Operations, Thriller, War Movies and tagged Alistair MacLean, Clint Eastwood, double agent, Gestapo, MI6, Nazis, OSS, Richard Burton, suspense, World War Two. I don’t think you gave enough credit to the percussionist (that driving snare drum in the score has been a part of my personal background music since 1968); thanks, even so, for reminding me of this absolutely captivating film! I should be working on other tasks today, but I think I’ll queue up this movie for some spring break entertainment. True — the soundtrack sets up an equivalence between the snare drum and machine gun fire that really adds to the tension! I enjoyed this when I watched it-especially the twist-but it’s been long enough that I need to go back and rewatch it, since I think I’ve completely forgotten it!